Applications for the 2019 Teach For India Fellowship are open now. The Teach For India Fellowship program is an opportunity for India’s brightest and most promising youth, from the nation’s best universities and workplaces, to serve as full-time teachers to children from low-income communities in some of the nation’s most under-resourced schools. c) Be fluent in the English language as Teach For India Fellows will be placed in English-medium schools and will be expected to teach in and attend training sessions conducted in English. 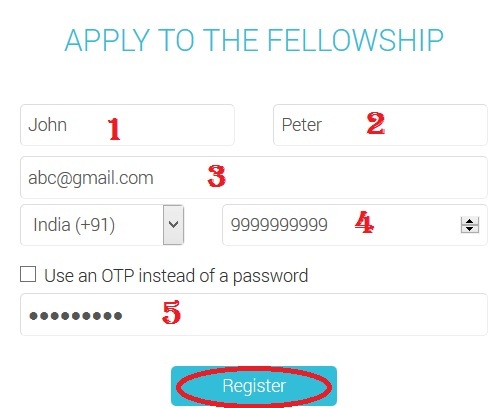 Just follow the below steps to apply for the Teach For India Fellowship 2019. Step 1 : Go to the official website of Teach For India provided above. Step 4 : Fill the remaining details to complete your application. Through a 3-staged process, the program selects the highest potential candidates. After submitting the application, a link to a one-hour online test (AMCAT) focussing on English language and decision making skills will be sent to the registered email id. This must be completed within 4 days from the submission date of the application form. Shortlisted candidates will be invited to the final stage of the selection process – an in-person Assessment Centre – where they will teach a 5-minute lesson, take part in a group discussion, and complete a short problem-solving activity before an hour-long personal interview. 1. In spite of registering, why have I not received an email yet? There are certain email services such as Hotmail that have a highly restrictive email filter and hence, it could be the case that the email we sent did not get delivered to you. We request you to register using a Gmail or Yahoo account. Also, please check your Spam/Junk folder to ensure the email has not gotten delivered there. If you have still not received the email, please email apply [AT] teachforindia.org and we will get back to you within 48 hours. 2. How much will I be paid during the Fellowship? Teach For India Fellows will be paid a salary of Rs. 19,000 per month. If required to relocate from their home city, Fellows will be given a housing allowance ranging from Rs.5500 to 10,000, depending on the city in which they will stay. In addition, Fellows will receive an allowance for school supplies. 3. How can I save the Application Form? The online application is designed to let you complete various sections in your own time before you submit the final version. Please ensure that you click on “Save Section” button at the bottom of every section before moving on to another section.